Hi Nico – how are you? I’m amazing but also well busy! Keeping things moving though. Great! To kick things off, tell us a bit about Beastwang. So we’re an underground music club night primarily based in Leicester which has essentially garnered a bit of a cult following. We just like to play bangers from any genre we see fit! It could be House, UKG, Dub, Grime, Jungle, you name it. The brand has been going since October 2012, going into its 7th year of throwing events. Our sole focus is to create that perfect atmosphere, we do this by taking the time to look at high quality sound, lighting, the way set times flow, and many more factors I won’t bore you with. We’re up to rave no. 114 and just to name some of the acts we’ve had (name drops incoming), Stormzy, TQD, Redlight, SASASAS, Hazard, Hype… I think we’ve booked most people in the scene. I counted the other day and it was bang on 100 headliners as it stands. Whilst saying this I must point out in no way is the night shaped around the headliners. I much like to think the headliners shape around our team of residents and friends that create the atmosphere that the night has. That sounds like a pretty good system you have going there. How did you get things kicked off with Beastwang? I never actually experienced a rave till I was 21, but I’ve always listened to underground music. My first dance music genre I was into was UKG when I was maybe 8 or 9. I have vivid memories of recording tracks from radio on my tape player, my cousins Avirex jacket that I would ask to have when he was too big for it and all those compilations I used to buy like Twice is Nice and Pure Garage! I think all of this has led me to what I do today. The first rave I went to was in January 2012, Detonate in Sheffield. The concept of seeing an artist that you listen to through headphones in the flesh was new to me. The production was also something I had never experienced. In Leicester I wasn’t aware of any nights of this caliber. For a fair few months, I think it is safe to say I was addicted to attending events around the country, once or even twice a week. Sheffield and Nottingham were the destinations. During this time I had booked to go Outlook Festival too that summer. When the month of May finally came around I couldn’t understand why Leicester didn’t have a scene like Nottingham or Sheffield. I felt that it was a big enough city for something to happen so why don’t I try doing something about it? Plans were under way, basically googling anything I could to help me understand how to put on event. I wasn’t a DJ or involved in the industry in any way so my knowledge was pretty much zero. Around a month before I held my first event, Outlook 2012 came around and as a novice to the scene, this event opened my eyes wide open. The first day experiencing a Swamp 81 takeover in the Moat stage – I look back to then and think jheeeeez that was something special. I couldn’t even fathom some of the sounds I was hearing. So many labels, artists and music lovers from around the world gave me the landscape to start my project in Leicester. 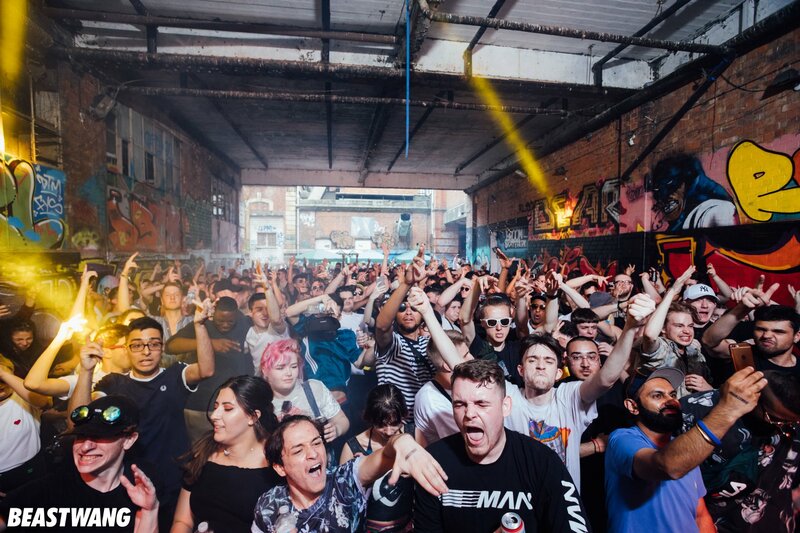 The first event started with residents covering House, UKG, Dubstep, Grime & DNB with attendees at 150, which led to 300, 450, 750 and now 1000+ after 6 years of ups and downs. I won’t lie, promoting events has been a journey and I’ve had some serious setbacks, but it sure does push you to your limits in all areas of business. Wow, that’s quite a journey you’ve had. It sounds like where you were based at the time was quite influential in what sort of sounds you were exposed to. What do you think of the dance scene in the midlands at the moment? It’s quite famous for its bass scene, but I’m sure there’s more than meets the eye. I think for many years, Birmingham and Nottingham would always be the topic of conversation whenever someone talks about the Midlands – though I’d like to think Beastwang is playing a part in slowly changing that, to put Leicester on the map. I can confidently say there is something for everyone depending on your taste within the underground music scene for events. We’ve had some great artists come through the Universities here such as GLXY and Unglued who are killing the Drum & Bass scene right now. Then in terms of Grime you’ve got Kamakaze, Massappeals and Jafro killing it. DJ SS has his Formation imprint that has been a staple in Leicester for years too. Legendary Finesse nights hosted DJ EZ on a regular basis (I’ve got some crazy unseen footage of him doing a madness on the mixer). Even Bassline and UK Funky were huge here with Supa Dupa nights. You can’t ever pin-point a genre to Leicester at the moment, because so many people are killing it in their own way. Even in terms of live music, you’ve got people like Mahalia and Easy Life flying the Leicester flag on the international stage. It’s not just the footy to shout about anymore. I think the only thing that is missing in Leicester is a dedicated underground music club, there are lots of event spaces but nothing catered specifically for dance music. Fine tuned sound systems, well thought-out line-ups and an aesthetic that gives the DJ the ability to dig deeper into their collection where ever they see fit. That would definitely be something a lot of people could benefit from. I’ve been toying around with the idea of starting something myself but taking on a premises is a whole different ball game and with venues on the decline it seems the wider establishment isn’t ready to have thriving venues. I can sympathize with you on that one – finding a perfect venue these days is difficult in the VIP DJ culture we have. I suppose having others t help might be useful. Tell us about the team behind Beastwang – is it just you? Or do you get some help? I wouldn’t be anywhere without the people that have helped me on the way. Day to day I’ve got two guys that work with me on the events. Jack handles marketing, and PJ handles operations and logistics, as well as them both DJing at the events. Then you’ve got Kurly who’s pretty much the face at the events who is the host & MC. Rav – the photographer – has been working with us for a few years now and then we have a pretty big team of brand advocates who help spread the word of Beastwang! Relationships are everything and I’m blessed to have such huge fam help and continue to grow the scene in Leicester. Looking at your past events, you’ve had some stellar lineups. What is a particular highlight? First ones that spring to mind is our first and recent outdoor event in a car park on an industrial estate with no huge headliners just residents and friends. The space is probably one of the best I’ve seen in the UK and I can only hope we throw another party there. Another one would be when we invited Oneman for our end of year party, I don’t think many people knew who he was but the flow of music that night was perfect between residents and him, proper party vibes from start the finish. The amount of dubs he has and his technical ability is something else. Combining that with his track selection left me in awe! Mind of a Dragon came down for a UKG night just over a year ago and he’ll probably kill me for saying this but I had to take him to his hotel and put him to bed he had that many tequilas LOL. The first time we had Royal-T, I’d never seen so much energy in a room. There was a club in Leicester called ‘Sophbeck’ and it was a 100 cap basement, that was the best place to DJ that I’ve experienced and I’m sure the headliners we had down there all enjoyed themselves. This night stuck in my mind just because there was no chill start to finish, people were just going nuts. Our after-movies and images from the event showcase the vibe of the nights pretty well, and I’d definitely recommend having a flick though them on our Facebook Page. Check out the slow-motion mosh pit one, Flava D dropped ASAP Ferg – Work and I decided to put that track from Charlie and the Chocolate Factory behind it…In a Worldddddd Of Pureeee Imaginationnn, it may sound mad but watch it seriously, it’s jokes! Sounds pretty fun if you ask me. Talking of lineups, what does the future look like for Beastwang? So in addition to your events, you’ve now set up a label, ‘Wang Records’. I’m always a big fan of new labels – what made you decide to go into releasing music? A number of reasons really! I want to take everything we’ve created with the brand to new places to build the fan base, and what better way to do that than start a label? I want to share my music taste with anyone and everyone. As a multi-genre club night I want to replicate that as a multi-genre label. I could never pick a particular sound or a genre so I’m doing what best represents our club nights. They could be soulful pieces of music or club bangers. Any releases coming up that you can tell us about? I can’t really say much right now but I have thrown myself in the deep end a bit by putting together a big compilation of one of my favourite genres, UK Garage. I’ve reached out to some of my favourite producers and it’s humbling to know so many people are up for working with us, artists that I rate very highly. I think it’s important for us to hit the ground running to coincide with the event part of the business. I’m sure you’ll be seeing the visuals for this project very soon. Another one in the works is a Grime single with one of my favourite artists at the moment that’s going to go on to do big things in coming years…TRUST ME, way too cold! Talking of artists, who are some of your favourite up – and comers in the scene at the moment? I’ve always pushed Mind of a Dragon, ever since I discovered him. I’m not sure if you can class him as up and coming but I rate his work rate whilst still maintaining bags of creativity. Ali Mck & IYZ are killing it at the moment; some of their sounds I’ve been listening to are way too dangerous. Tenshu has a new piece that he sent me the other day that is madness. Yumna Black (PJ) has potential to go on and do great things. He’s sitting on so much music I need to get out for the world to hear! 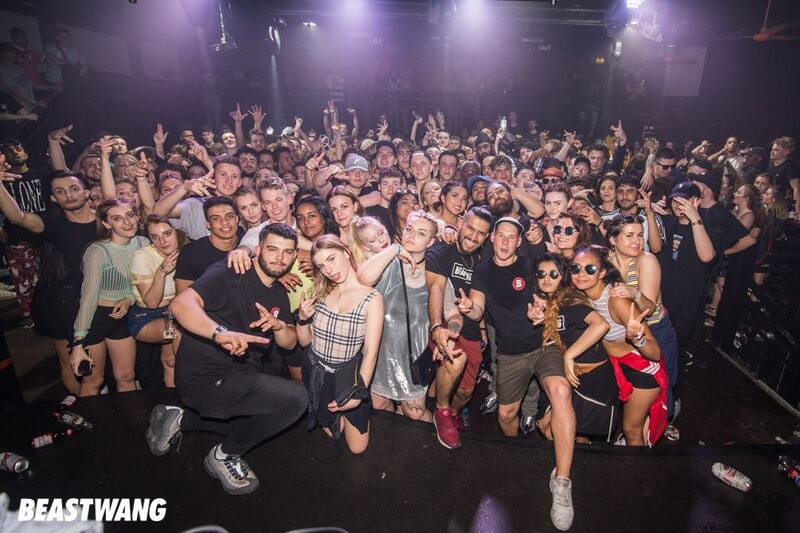 And finally – the future of Beastwang and Wang records – what’s the long term goal? 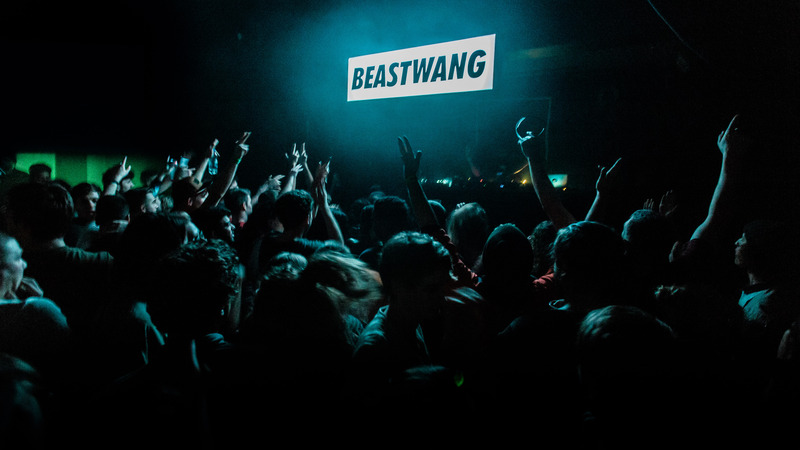 For Beastwang in Leicester I want to continue putting on big scale events and events in unusual spaces whilst still maintaining that family vibe. Everything that I wanted to achieve many years ago, we’ve now made it there in terms of events. If I can also take this around the country or even oversees I’ll be super happy. With Wang Records I’d love to be able to put together a collective of artists I have a great relationship with. Artists that I work with on a regular basis to help them all grow as individuals that form part of a bigger group. I guess the main important thing is the feeling that you’re contributing to the scene.